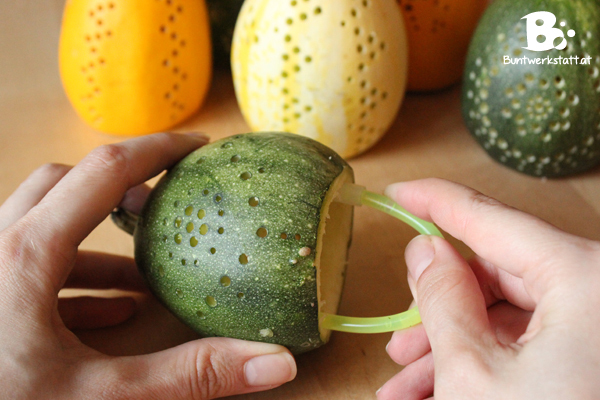 There is a really cool and simple alternative to carved Halloween Pumpkins. – Drilled Halloween Pumpkins! Fun, easy and fast! This rotary tool is so professional and versatile, I’m still soooo happy with it! 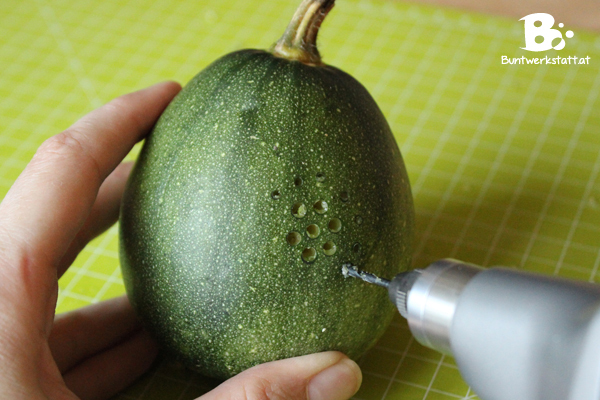 You can use different drills with it and make the most amazing patterns in your pumpkins. 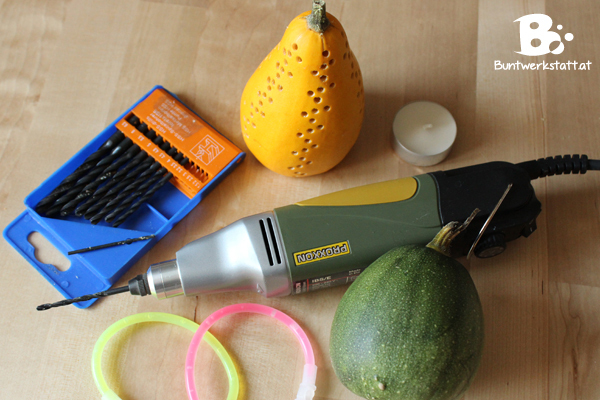 a lot of small decorative gourds (but you can use edible pumpkins as well), my electric drill (available here*), glow sticks (available here*), knife and spoon. You can make random patterns with your drill. You’ll get the best effect with different drill sizes. 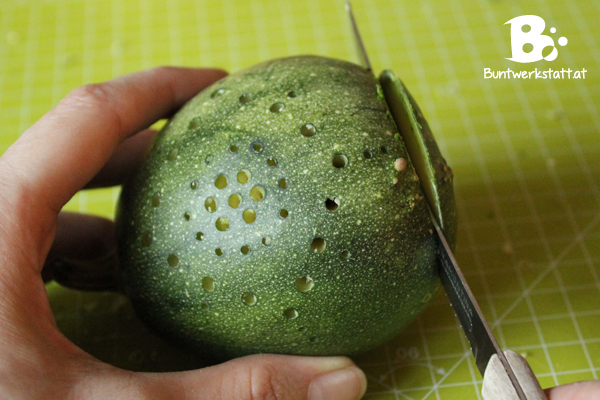 Just drill a few inches into the pumpkin until you reach the hollow inside. You’ll feel that at once. If you do a circular pattern, just start in the center and build it from there. You can also do horizontal or vertical borders. Cut the bottom off the pumpkin with a sharp knife. You could also do this at the top or carve an opening in the back, but I like this method best. You can’t tell that there is a cut on the bottom once you place your pumpkin on the ground, and it’s very stable this way. Scoop out the insides with a spoon. I like to keep the seeds and plant them again next year. 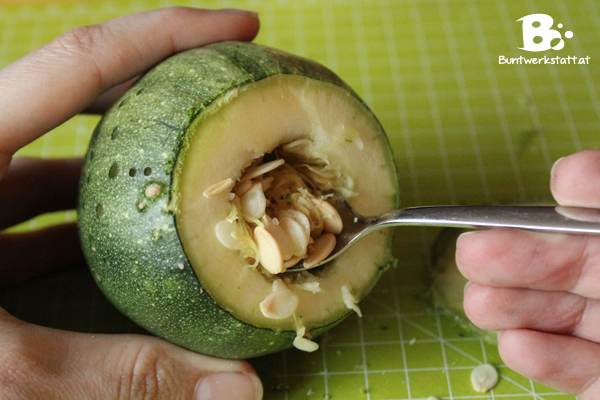 If you use an edible pumpkin, you could roast them or make other delicious stuff with it. A really simple and safe alternative for candles are Glow Sticks! You can buy them nearly everywhere, or find them online (available here*), and they come in a wide range of colors. Just activate them and put them in your pumpkins, and they will glow throughout the night.